National Pilgrim Paths day 2015 features on the History Show on RTE One Radio on March 22nd 2015 – coverage starts at 7 minutes and lasts about 4 minutes. Presenter Myles Dungan interviews Chairman of the Pilgrim Paths group, John G. O’Dwyer. 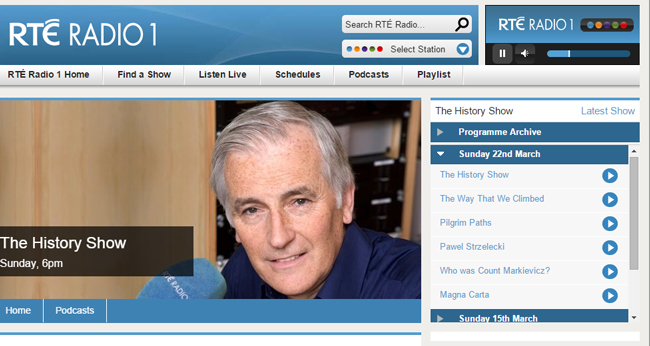 Just be aware that archives only last a few weeks on RTE’s website, so the link will cease to exist at that stage. Pilgrim Path shared a photo. Pilgrim Path shared a post. Get an unlimited stream of top news stories in your home feed — no sign up required. Copyright © 2019 Pilgrim Paths.All rights reserved.